Rep. Paul Ryan may want the Republican Party to make a more assertive case for its conservative proposals, but don't expect a major legislative push to enact his ambitious agenda even if the GOP wins the Senate this fall. In an interview with The Wire, the GOP's vice presidential nominee in 2012 preached prudence for his party in the short term, tempering expectations for what a Congress fully under Republican control could accomplish while President Obama remains in the White House. That means that Ryan's far-reaching, but politically fraught plans for overhauling entitlement programs and the tax code are likely going to stay in the development stage for another two years. "I think we're going to have to be prudent based on the circumstances that are in front of us," Ryan told The Wire by phone over the weekend as his toured the country to promote his new book, The Way Forward: Renewing the American Idea. 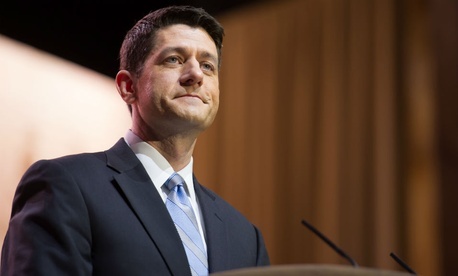 As the House Republican budget chief for the past four years, Ryan has rallied his party around conservative proposals to partially privatize Medicare, turn Medicaid into a block grant for the states, and gut the nation's Byzantine tax code. But with few exceptions, those ideas have never made it beyond his annual budget blueprints, which don't have the force and effect of legislation. Come January, however, Ryan is the heavy favorite to become chairman of the House Ways and Means Committee, where he would have jurisdiction over the very programs he seeks to reform. And the better-than-even chance that Republicans can gain winning control of the Senate in November has led conservatives to dream of forcing the president either to accept or veto the changes they want to see in the nation's entitlement programs. Yet in our interview, Ryan made clear that he sees little chance of a major breakthrough with Obama, and he wouldn't commit even to holding a vote on legislation implementing his reforms to Medicare, Medicaid, and the tax code. The next two years, he suggested, are more about showcasing what Republicans would do if they had the White House themselves. Whether we pass something or not, that's less important than spelling out the specifics of what our vision looks like. We'll have to see what kind of majority we have, if we even have one." Ryan's campaign-style memoir has fueled talk of a presidential run in 2016, and his caution in advancing his proposals too quickly could signal that he wants to save them for himself rather than try to cut a deal with Obama – a man he described in the interview as increasingly "exasperated," "short-tempered," and "partisan." As he has done repeatedly in recent weeks, Ryan deflected a question about 2016: "All those things I'm going to explore in 2015," he said. Yet Ryan's comments also reflect the political risk associated with his proposals. While his sweeping budget plans have passed the House each of the last four years, Democrats continue to attack them relentlessly, and the Republican leadership in the Senate has yet to fully embrace them. The likely majority leader if the GOP wins the Senate, Mitch McConnell, wouldn't commit to Ryan's plan in an interview with Politico earlier this month. Ryan also witnessed the difficulty that the current Ways and Means chairman, Rep. Dave Camp (R-Mich.), had when he released his long-awaited detailed tax reform plan earlier this year. Though the proposal had been in the works for years and drew praise from Ryan, it never even made it to a committee vote. Ryan laid out a more modest set of goals for a Republican-controlled Congress in 2015, focused on blocking more of Obama's nominees and regulations ,while laying the groundwork for more ambitious policy changes under a future Republican president. I think we make sure, [if we win the Senate] that we stop left-wing judges from getting to the court or ideologues from running the regulatory agencies. We try and prevent onerous regulations from stalling our economy. We put legislation on the president's desk that at least makes him make a decision, which [Senate Majority Leader] Harry Reid (D-Nev.) has been preventing him from doing. We take incremental gains that go a step in the right direction, that have a chance of getting signed into law so we can make some modest progress in the next two years, and we also pass aspirational reforms that explain who we are, what we believe in, even if he won't sign them into law so we can define ourselves with our own actions. Where Ryan is clearly adamant, both in his book and in the interview, is that Republicans can't shy away from putting forward their own detailed policy prescriptions, even if it doesn't come in the form of immediate legislation. "Let's give voters a meaningful choice. If you don't like the direction the country is going in, then let's show how we would do things differently," he said. "We ought to have that kind of a cleansing election, where the country has a very clear, specific and legitimate choice between two futures."